Falkirk’s annual wargames show proved to be a success as far as I was concerned – and a friendly show as usual – and I carried nearly 2kg of 10mm metal home with me. Besides picking up my newly cast order from Pendraken, I wanted to sample some odds-and-ends from the Old Glory boys to try and fill in some blanks in the present Pendraken range. Despite Old Glory’s stock taking a battering from the recent outing to Salute, Britain’s biggest wargames show, I managed to get six packs (for the price of five), only having to substitute French for the Austrian artillery gunners I would have preferred. Before anyone manufactured plywood or MDF wargames bases in the UK, I ordered round and hex bases from Litko in the US. I now get all my round and hex 3mm MDF bases from local Scottish company Warbases. The company is based in Falkirk so they hadn’t far to go for the show. 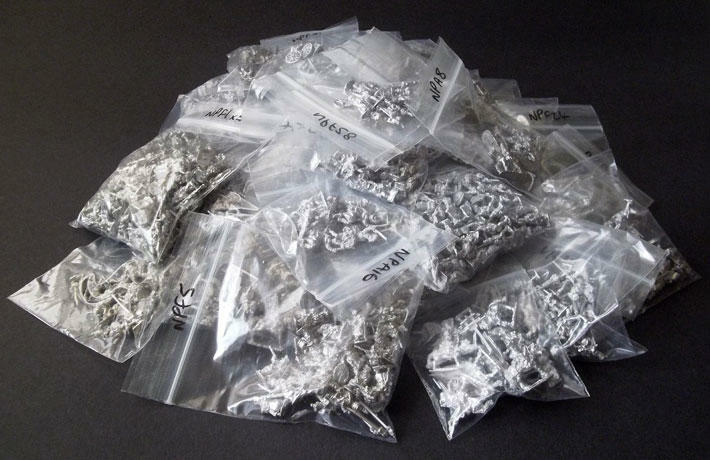 I had plans for 30mm round bases – not a size I have needed before – so I made sure I went home with a pack. My Carronade pile of Pendraken and Old Glory 10mm.